The above prices are subject to an additional $242 for taxes/fees levied on flights that occur as part of the tour. The internal airfares ARE included (any exceptions are listed in red below), but we list the taxes separately on your invoice as they are beyond our control and can change at any time. Optional Single Supplement: $1211 USD (number of singles limited). This tour may require a mandatory single supplement charge of $605 if you join our share program and we are unable to pair you. 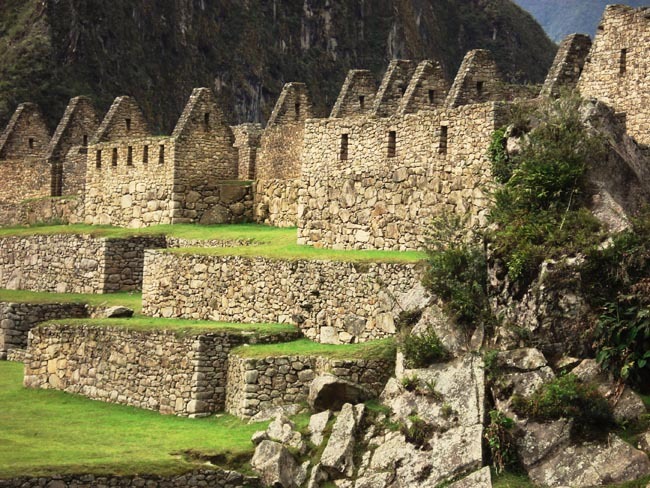 We've been offering tours to Peru and Chile for years, but it has been a long time since we offered an itinerary featuring both in one incredibly diverse and highlight-packed trip. The lifetime must-sees we cover over 21 sensational days comprise an impressive list as we cover a vast piece of incredibly scenic ground. 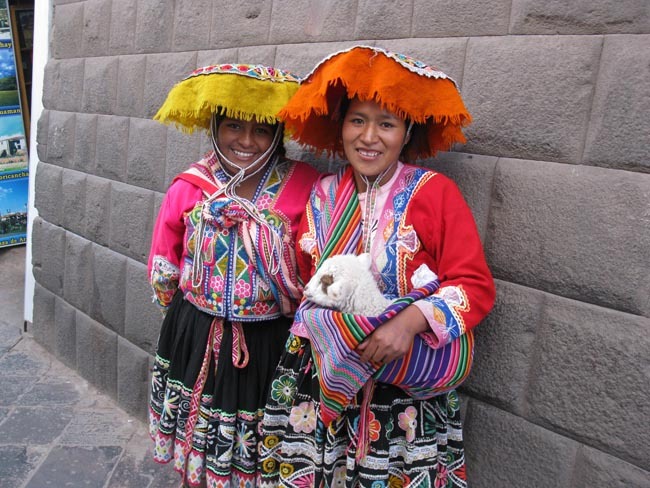 Rounding out this Peru & Chile tour are the many cultures and fascinating history of these two friendly and welcoming neighbours. NOTE: This itinerary is based on air schedules that can change without notice. Though this program should provide a very good sense of how this tour will be accomplished, some adjustment/s may be required up to the time of departure. A schedule change may require that we fly to Santiago tomorrow morning. This morning we will explore the city of Santiago! Situated in the country’s central valley, and home to 7 million people, Santiago’s rapid economic growth has made it one of South America’s most developed cities. Its unique urban environment artfully unites classic and modern. Our city tour takes you to the main attractions of the city including Cerro Santa Lucia, the ‘Classic Quarter’, La Moneda (Government Palace), the Municipality of Santiago, the National Historical Museum & the Santiago Metropolitan Cathedral (Catedral de Santiago). 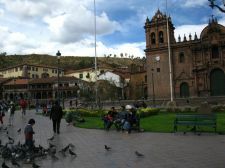 We will visit Santiago's Plaza de Armas, a typical meeting point for chilean people. 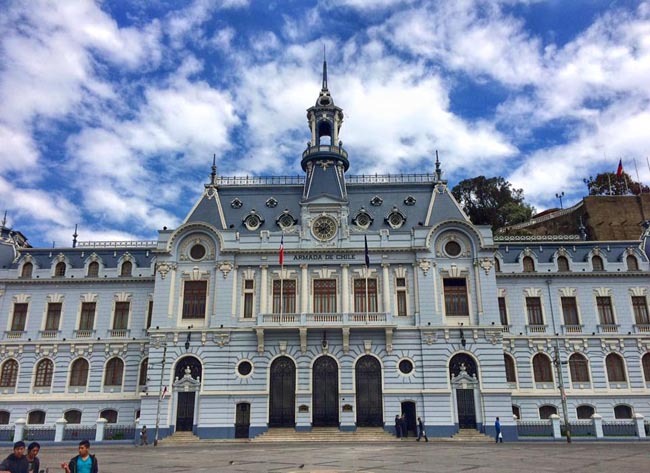 As the midpoint of the Spanish settlement of 1541, the square was once a military training ground, hence its name, but with time it became the focus of Santiago's social and commercial life with some of the nation's most accomplished architecture. This afternoon we will travel south of Santiago in order to visit the scenic Maipo Valley, one of Chile's most important wine-producing regions. Maipo is at the very northern end of Chile's extensive Central Valley, and is home to some of the country's most prestigious wines. 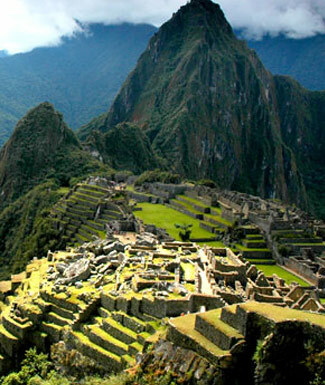 This region is often described as the 'Bordeaux of South America'. 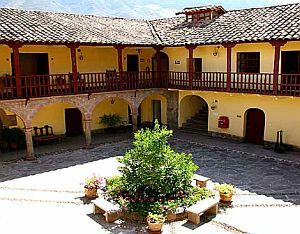 During our time here we will visit one of the area's most important wineries, Concha y Toro. In Don Melchor Square our local guide will invite us to enjoy a panoramic view of the Pirque vineyard, while tasting a glass of its world class wine. We will stroll through the winery's century old vineyards and visit the Pirque's House, the residence of the Concha y Toro family. This is where Chile's largest winery was founded a century ago. Today we fly from Santiago to Punta Arenas in Patagonia. Punta Arenas is located at the foot of the Andes on the western side of the Strait of Magellan, facing the island of Tierra del Fuego. This port city attracts commerce and shipping from all over the South Atlantic. Founded in 1848, the city was originally a military garrison and a penal settlement. Port facilities soon became established as a stopover for shipping en route to California during the Gold Rush. The population increased and the town developed as a result of the wool boom of the late 19th and early 20th centuries. During the last quarter of the 19th century, 300 purebred sheep were imported from the Falkland Islands. Such was the success of subsequent breeding that by the turn of the century there were almost two million sheep in the territory. Immigrants from all over western Europe were attracted to the area, bringing with them major developments to fishing and farming. Today we travel by road from Punta Arenas to Torres del Paine National Park. The start of our journey takes us across the flat rolling pampas, or ‘plains’. 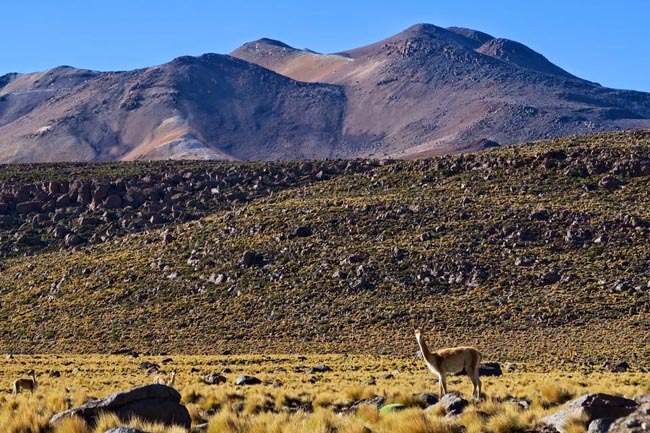 The Patagonian steppe is one of the last strongholds of the guanaco and Darwin's rheas, both of which we hope to see along the way. Patagonia is a sparsely populated region located at the southern end of South America, shared by Argentina and Chile. 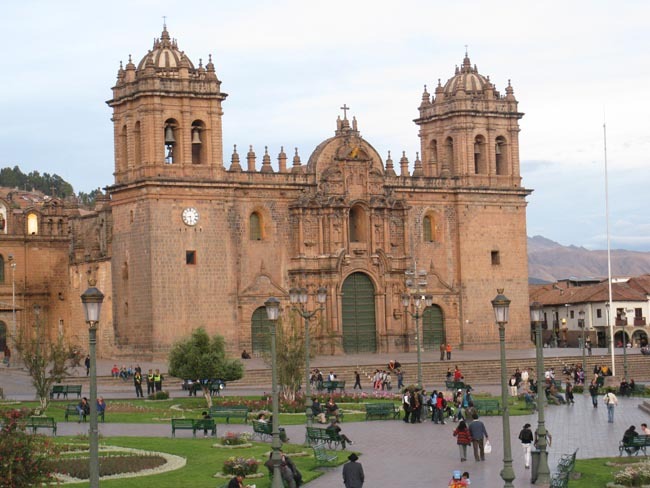 The region comprises the southern section of the Andes Mountains as well as the deserts, steppes and grasslands east of this southern portion of the Andes. We will stop for lunch in the small town of Puerto Natales, which sits alongside Ultima Esperanza Sound. Not far from Puerto Natales is the Mylodon Cave. This area became known to the world a little over 120 years ago when in 1895 the settler Eberhard Hermann visited the cave and found inside it the fur of a Mylodon, a large extinct sloth. We will make a stop here to walk the scenic path that brings us to the mouth of the cave. From here we continue to the southern tip of the Andes in Chile, and Torres del Paine National Park, one of the most impressive sights in the Southern Hemisphere. The park encompasses ancient forests, glaciers, lakes, rivers and fjords, and fauna including guanacos, foxes, pumas and a diverse array of birds. The Torres del Paine (Towers of Paine) are spectacular granite pillars that soar almost vertically more than 2000m (6,000 feet) above the Patagonian landscape. 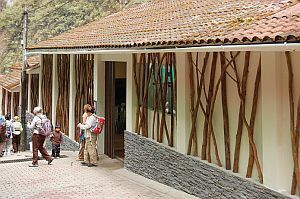 The park in which the high peaks sit may be considered the finest national park in all of South America. With turquoise lakes, roaring waterfalls, rivers and creeks, dense forests and sprawling glaciers this is an unequalled destination. Overnight in Torres del Paine National Park. Today we spend the entire day exploring Torres del Paine National Park. We will travel by coach bus throughout all accessible regions of the park, stopping at various places of interest and scenic viewpoints. The photogenic panoramas are endless and, when the weather is clear, panoramas are everywhere. 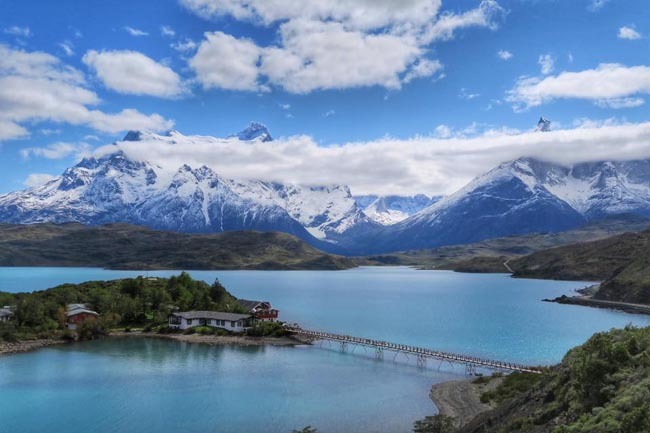 We will also have the opportunity to walk along some of the easy-going trails that afford expansive views of the mountains, waterfalls and glaciers for which Patagonia is famous. At Grey Glacier we will walk to the glacier viewpoint. 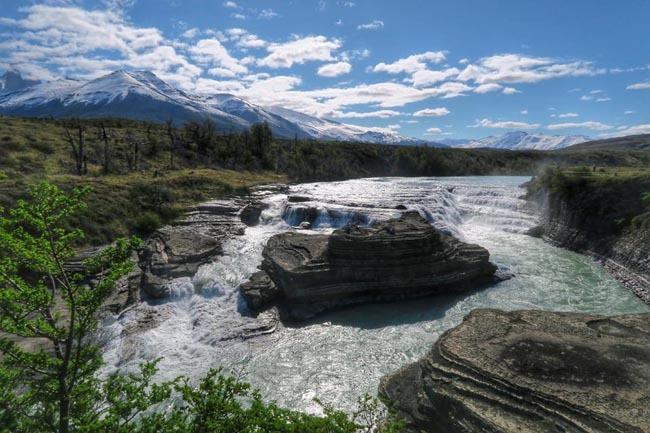 A short walk in the heart of the park will bring us to Salto Grande, a spectacular waterfall on the Paine River. During our day we will also see the Cascada del Rio Paine (waterfalls), and Lago Pehoe (Lake Pehoe) in the heart of the park. Some say Paine was the name of an early settler. Others say the name comes from an ancient Indian word meaning blue -- hearkening to the intense blue of the area's lakes. Wherever the name comes from or means, this is a spectacular park, comparable to Yellowstone or Yosemite in the US. 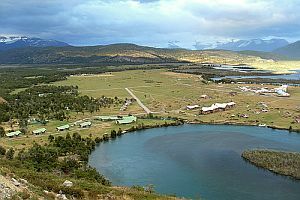 Founded in 1959, Torres del Paine takes in 180,000 ha (450,000 acres). In 1978 UNESCO gave the park World Heritage status, recognizing it as a biosphere especially worthy of international recognition. 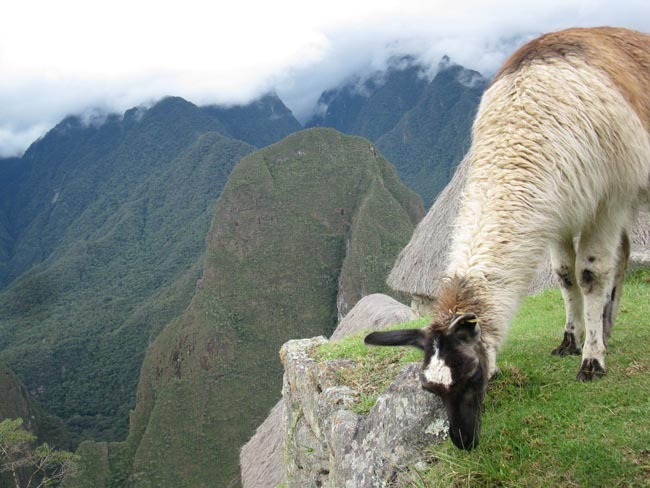 The park is part of the Paine Massif, which lies inside the continent from, or east of, the high central Andean spine. The massif are medium high mountains emerging suddenly from the plains of the Patagonian steppes. The mountains are granite, capped by crumbly sedimentary rock that used to lie on the valley floor. Before the Chilean government acquired the park, it belonged to ranchers who overgrazed and also burned down forests to increase pasture area. The glaciers of the park are in quick retreat--up to 17 m (56 ft) a year for the last 100 years, creating a fascinating study of plant succession and soil build-up from bare rock to forest. The flora of the park ranges from grassland to southern beech forests. Many parts of the park were too remote for the cattle ranchers, and exist today in a pristine state. The animal stars of the park are the Guanacos -- wild South American cameloids, related to the domesticated llama and alpaca -- and the Rheas, an ostrich-like bird. Native peoples hunted both across the plains, using every part for food and shelter. 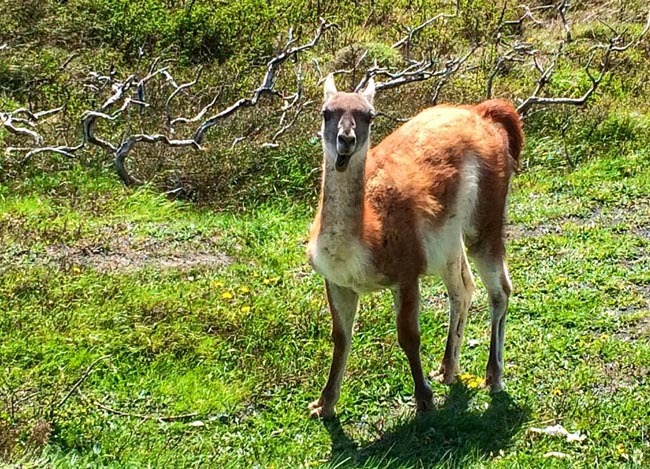 When the Europeans came, the Guanaco were slaughtered to make way for cattle and almost became extinct. This morning we depart Torres del Paine and travel back to Punta Arenas. 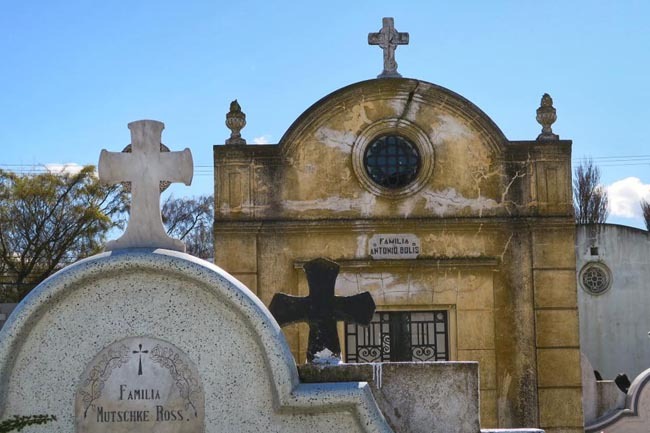 Upon arrival in Punta Arenas we will make a short visit to the Municipal Cemetery. This is a fascinating place to stroll around due to its immaculately trimmed cypress trees and tree-laced pathways. The cemetery is resting place of pioneers, immigrants and families of diverse nationalities that left their mark in the colonization and development of this isolated part of the world. This morning we fly to Santiago and connect with our flight to Calama in the high Atacama Desert, the driest place on earth. On arrival we transfer to San Pedro de Atacama, elevation 2300 m (7,600 ft). Northern Chile is home to the world's most arid desert and its salt flats, hot springs and geysers as well as large deposits of copper and other minerals, Calama and other parts of the altiplano. This region also boasts fertile ravines and oases, inhabited by some of the country’s native peoples. 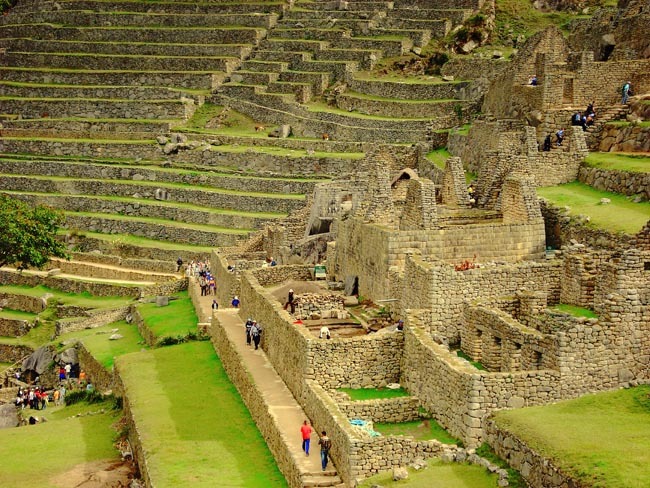 Both Incan and Spanish influences can be seen in its villages, and evidence of human existence in this area dates back over 10,000 years. No significant precipitation has been reported here since the Spanish colonial period. 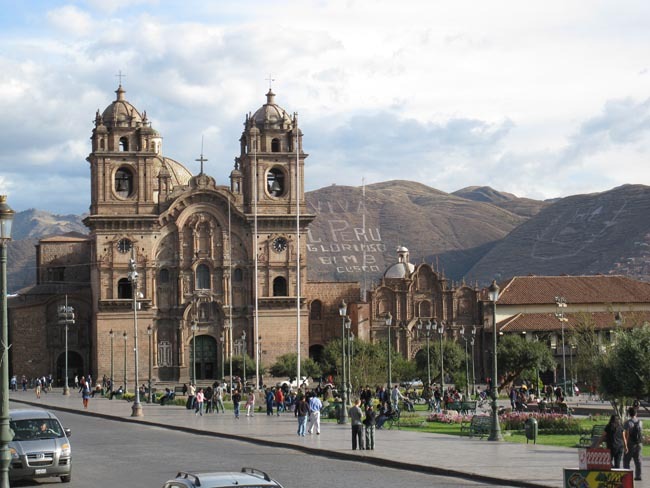 (Depending on flight schedules we may either connect to Calama or overnight in Santiago and then fly tomorrow morning). We start our touring today with a visit to the Salar de Atacama, the world's largest salt lake. Rich in minerals, including borax and lithium, this salt lake is home to flamingos and many other bird species. Salar de Atacama is formed by waters flowing down from the Andes that, unable to escape from the basin, are forced to evaporate, leaving salt deposits on the earth. In some areas, lagoons peek out from under the crust, such as at Laguna Chaxa. At Lago Chaxa, part of the Reserva Nacional de los Flamingos, one often can get quite close to flamingos in their natural habitat. From here we travel to the small colonial town of Toconao. The material of choice here is volcanic rock for both local crafts and the town church (1744) and San Lucas bell tower (1750). 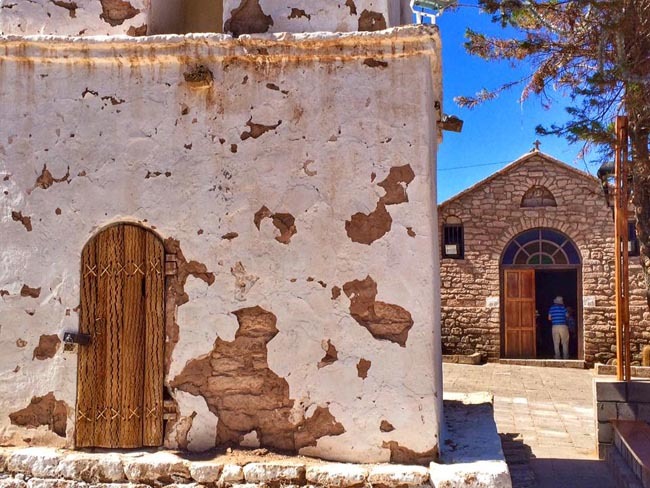 The church and houses in this picturesque village are built of bricks of the local white volcanic stone. You will have some free time here to wander the small streets and explore this quiet location. We later return back to San Pedro for lunch and some free time before heading out again in the afternoon. This afternoon we will visit Tulor, a 2,800-year-old site where evidence of the earliest habitation in the region was found. 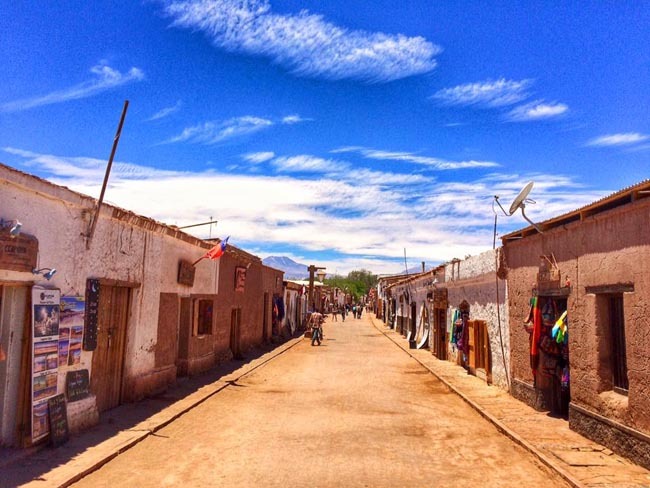 Located in an ancient oasis once supported by the San Pedro River, Tulor Village is one of the most important ancient villages in the Atacama Desert. We will also visit the fort of Quitor (Pukara de Quitor). The Atacameño people built this Pukará in order to defend themselves from Pedro de Valdivia and the Spanish in northern Chile. This pre-Columbian archaeological site overlooks the valley of the river San Pedro and was designated a national monument in 1982. 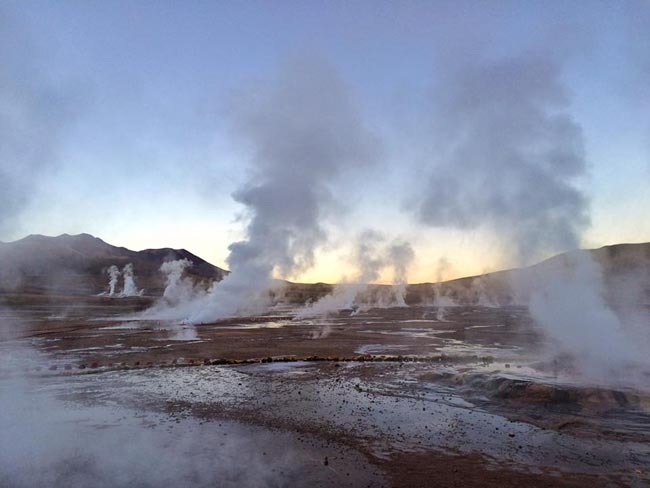 We leave the hotel early this morning before sunrise and travel northeast to see the spectacular geysers of El Tatio (elevation 4400m / 14,500 ft) located within the Andes mountains. We arrive at the site in time to watch the sunrise over the mountain. Here the super-heated water gurgles in the frozen ground and emerges violently as steam in over 100 geysers, boiling pools, and fumaroles. 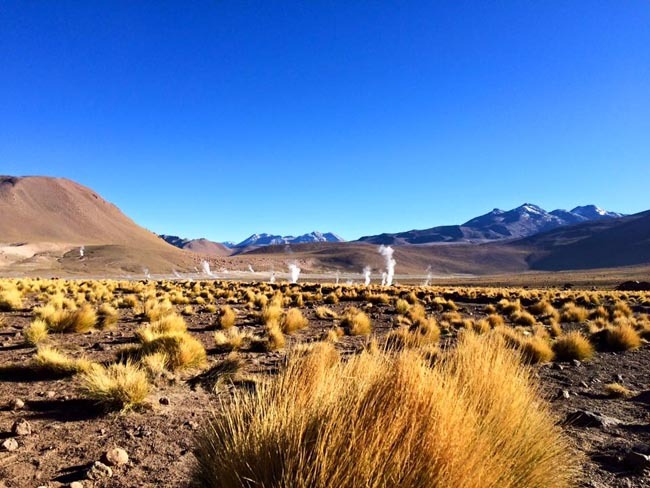 El Tatio is the largest geyser field in the southern hemisphere and the third largest in the world. 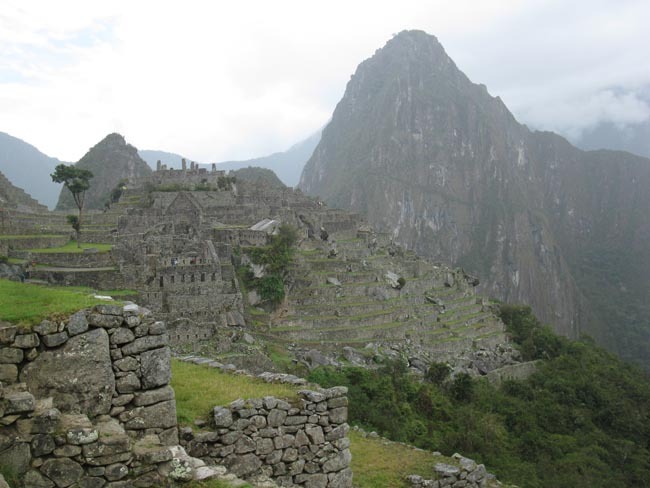 From here we continue to explore the beauty of this region of the Andes. 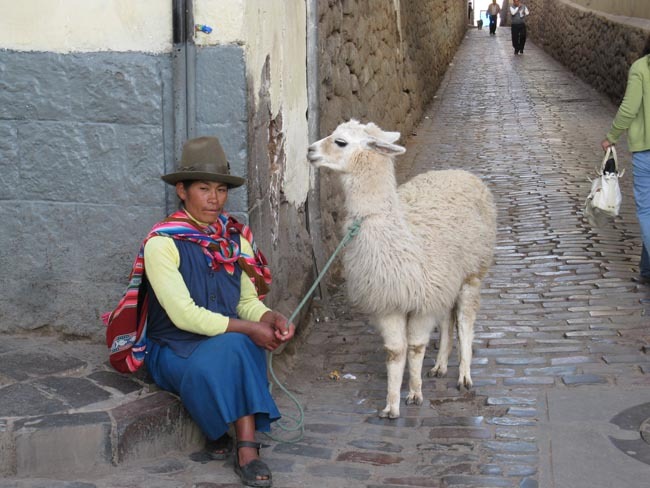 If lucky we will have some great photo ops of vicuna along our route. 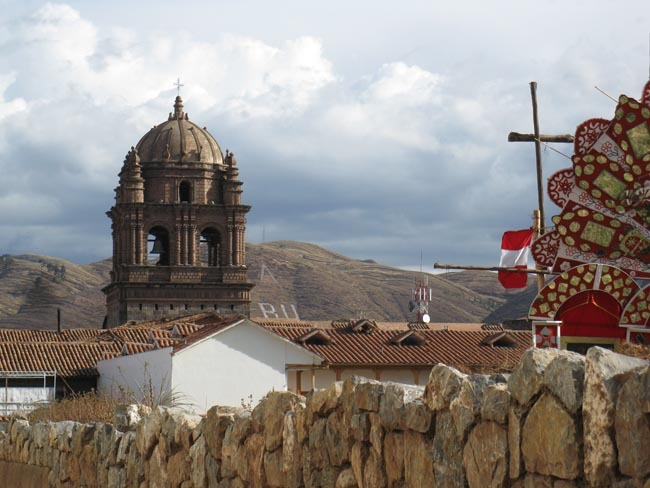 We will also stop in the tiny village of Machuca. 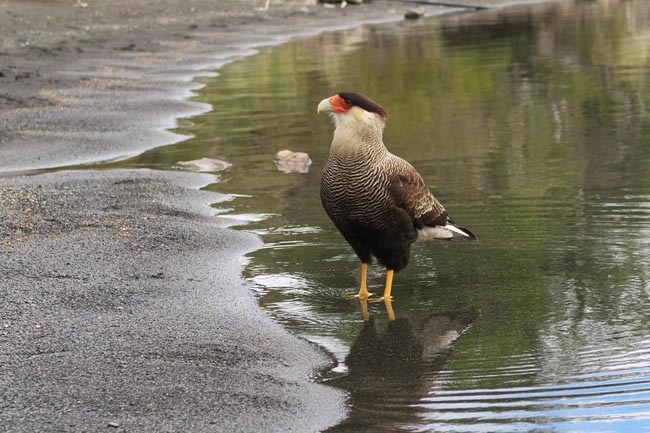 The small lakes and lagoons in the area are home to a number of indigenous bird species including the Andean Goose and Giant Coot. We will return back to San Pedro for lunch before heading off again in the early evening to the Valley of the Moon. You will be wowed by the lunar-like landscape of the valley, which lies in the Salt Mountain Range. We will explore its many geological formations, from canyons to caves to depressions, and learn about the physical history of the area. From atop a sand dune you will be provided with some unique panoramas. Just prior to dusk we drive to the upper ridge of the Valley of the Moon to see the sunset in this bizarre lunar landscape formed by erosion of the salt mountains. Light reflecting off the salt crystals is an eerie sight. We then return back to San Pedro after sunset. Today we drive to Calama for our flight back to Santiago. Depending on today's flight schedule, there may be some free time in San Pedro de Atacama in the morning, or in Santiago in the afternoon. Today we fly from Santiago to Easter Island. Upon arrival at Mataveri Airport we see the first of Easter Island's famous Maoi, or stone statues. 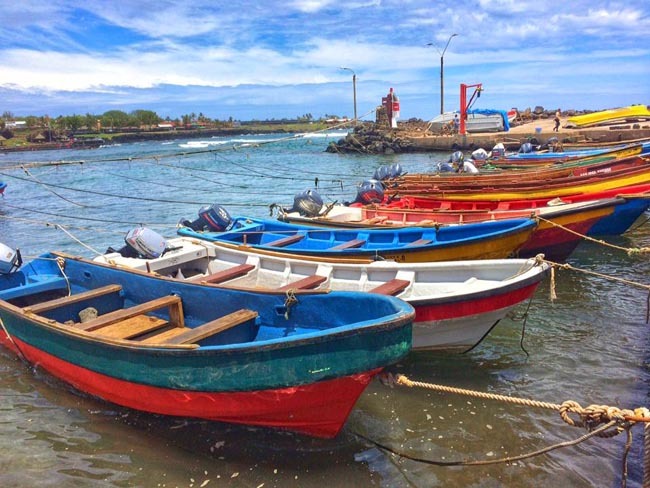 Hanga Roa, the capital, is where most of the island's population of about 5,500 lives. Typically South Pacific in appearance, the pace in the village is typically slow. Easter Island is over 3200 km from the nearest population center (Tahiti and Chile), making it one of the most isolated places on Earth. This triangle of volcanic rock in the South Pacific is best known for the giant stone monoliths, known as Moai, that dot the coastline. Almost 900 giant stone figures dating back many centuries reveal their creators to be master craftsmen and engineers. These stone figures are distinctive among other stone sculptures found in Polynesian cultures. 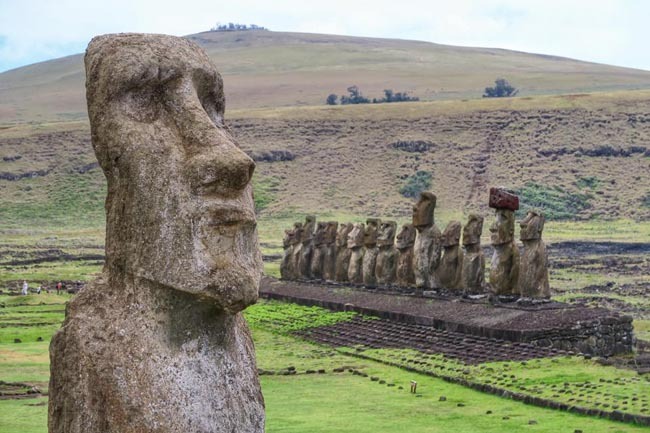 There has been much speculation about the exact purpose of the statues, the role they played in the ancient civilization of Easter Island and the way they may have been constructed and transported. 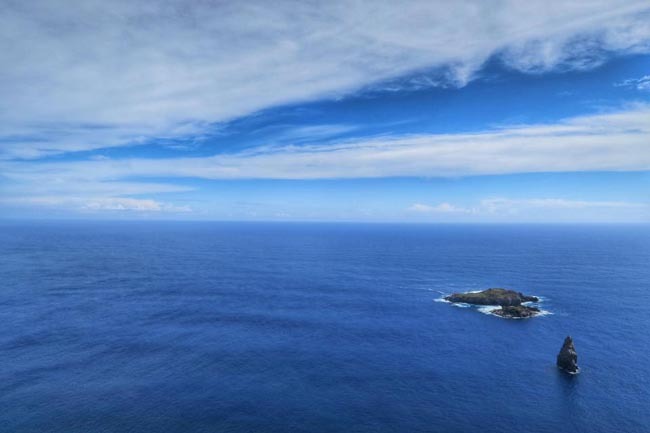 The early settlers called the island "Te Pito O Te Henua" (Navel of The World). Admiral Roggeveen, who came upon the island on Easter Day in 1722, named it Easter Island. 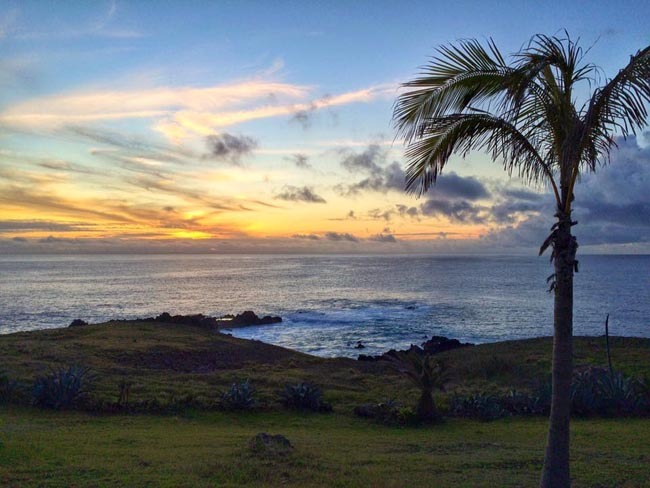 Today the land, people, and language are all referred to locally as Rapa Nui. Today we will start our touring with a visit to Ahu Akivi. Restored in the 1960’s, Ahu Akivi has seven standing moai, and is the only ahu with moais that appear to be looking out towards the ocean. All other moai on the island face inland. We then make a stop at Puna Pau. Puna Pau is a small extinct volcano whose name means ‘dry spring’. What is most important today is that Puna Pau volcano’s crater was the quarry from where the stone needed to build pukaos, or moai headdresses, was taken. The red volcanic rock found here is soft and easy to carve, and it has a high iron content, which gives it its characteristic reddish color. 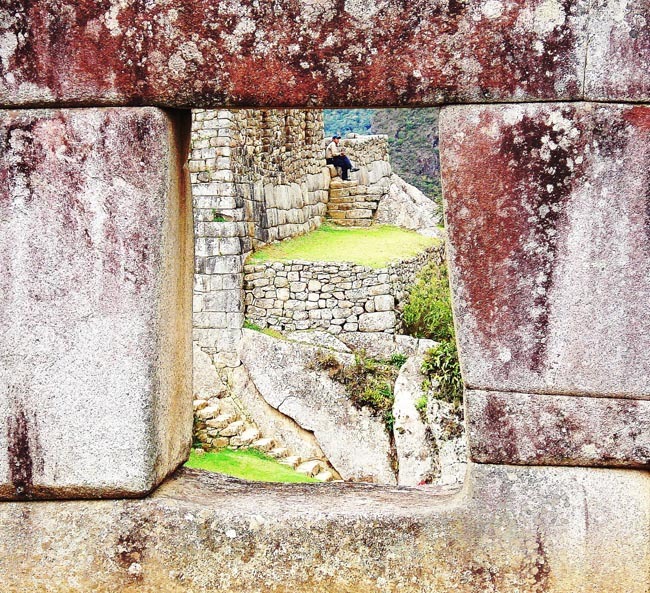 At Ahu Vinapu we see the incredible stone walls similar to those built by the ancient Incas; the architecture of these walls is sometimes used as an argument to support the theory that the early islanders came from South America. We will take a break for lunch in the center of Hanga Roa before heading to the southernmost volcano of the island, Rano Kau. From here we will have an opportunity to see most of the island as well as its reed-covered lake. On the west side of the slopes you have an impressive view of the islets Motu Wui, Motu Iti and Motu Kao-Kao. The main feature on Rano Kau is its rebuilt ancient ceremonial village of Orongo. In primitive times it was used for the traditional egg-ceremony, taking place year after year to choose the religious head of the island. 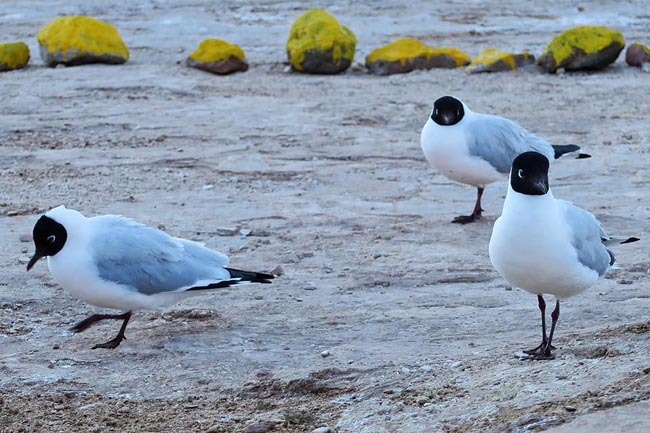 The site is full of petroglyphs representing Tangata Manu (birdman) and the god Make-Make. Today we start our full day of touring with a visit to the spectacular Rano Raraku quarry, a highlight of any visit to Rapa Nui. This location is a classic symbol of the island and the original factory of the moais. Here we will see the dozens of gigantic statues that cover the inner and outer slopes of the volcano. We so many statues in situ, we are able to admire them in different stages of production, from carving in the rock to upright position and lying face down on their intended road to their platforms. From Rano Raraku we proceed to Ahu Tongariki, the largest Moai site of Easter Island. Here we see 15 moai lined up, including the largest moai ever erected on the island. The Moai (with their pukao) were toppled in the 17th century during a tribal war. Fortunately none of them were broken, and they remained on the ground until the great earthquake of 1960. At that time a large tsunami took the fallen statues and the pukao and scattered them further inland leaving them a couple of hundred meters from their original location. We continue along the south coast, stopping at Ahu Akahanga, a large ahu (platform) with four big fallen statues. According to legends, the tomb of the first king of the island is in this area. We then visit Vaihu, another ancient site in ruins. This afternoon after lunch we head across the heart of the island to Papa Vaka, located on the north coast. Papa Vaka is an archaeological site located on the island’s north road, and is characterized by its numerous petroglyphs (designs carved into rock) with motifs related to the sea and fishing. Our last stop today will be at the beautiful archaeological zone of Anakena where we see the standing moai. He we will spend some time at the beautiful white sandy, coconut-palm lined beach. This setting is decidedly Polynesian, and a great place to end our day. Today we travel back to Santiago. Depending on the time of our flight, you may have some free time today in either Easter Island or Santiago. The staff of Hotel Iorana will treat you with traditional friendliness and warmth, making sure your stay will be a ...	one. 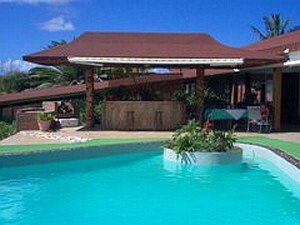 The hotel features a bar, dining room, lounge with TV and video, phone, laundry, 2 swimming pools. Rooms have direct dial phones, air conditioning, private baths / showers, balcony, mini bar, hair dryer. 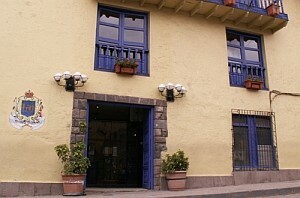 Breakfast and dinner daily (hotels and local restaurants). All transport (including internal flights), sightseeing and entrance fees for sites noted as 'visited' in the detailed itinerary. Gratuities for local guides, drivers, restaurant staff, porters. Airport transfers for land & air customers arriving / departing on tour dates. Transfers are included for land & air customers who arrive early/depart late provided their extra nights are booked through us. International airfare to/from the tour. Tour Leader gratuity, lunches, drinks, personal items (phone, laundry, etc), departure taxes, domestic and international air taxes (if applicable). Airport transfers for Land Only customers. Optional trip cancellation insurance. Our post-reservation trip notes offer further guidance on optional meal costs, shopping, entry requirements/costs, and locally paid departure taxes. More so than probably any other tour we offer, this trip will cover pretty much every weather condition you can imagine. Though our dates coincide with the cooler, drier time of year in Peru, conditions will still vary greatly depending on elevation, aspect, proximity to mountains etc. Andean weather is notoriously changeable and one must be prepared for the full gamut. Shifting to Chile, one can assume simply by the shape of the country and its incredible span of latitudes, that it is likely that we will experience all four conventional seasons while there. Our October/November date heralds the arrival of spring in Patagonia, which is a cool and windy place at the mildest of times. That said, however, spring and fall tend to be less windy in the deep south than mid-summer, when temperature extremes tend to amplify prevailing onshore winds. 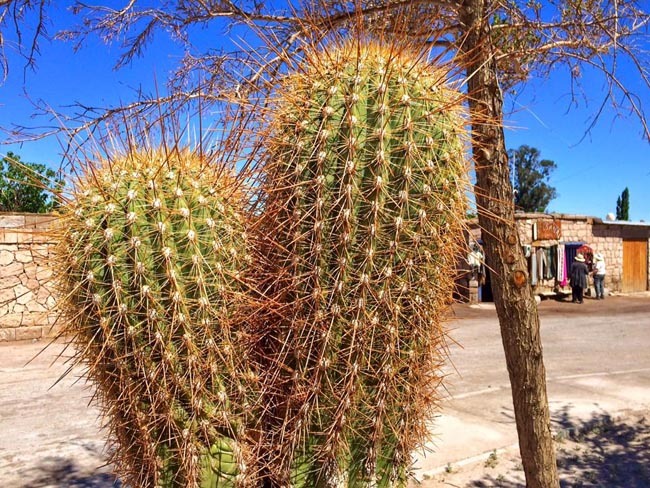 Santiago will be temperate and comfortable, the Atacama will be cool and dry as always, and Easter Island will end the tour on a warm sub-tropical note. This tour will definitely test your packing light talents and prove the old travellers' adage that "less is more" and that layering is the key to your ultimate success. Road transport throughout will be provided by private air-conditioned/heated motor coaches, likely 24-30 seats depending on ultimate group size (see 'group size'). Though we will have some full bus days in Chile, overall road travel is not particularly arduous as roads are generally in good condition, though a little winding on some stretches. 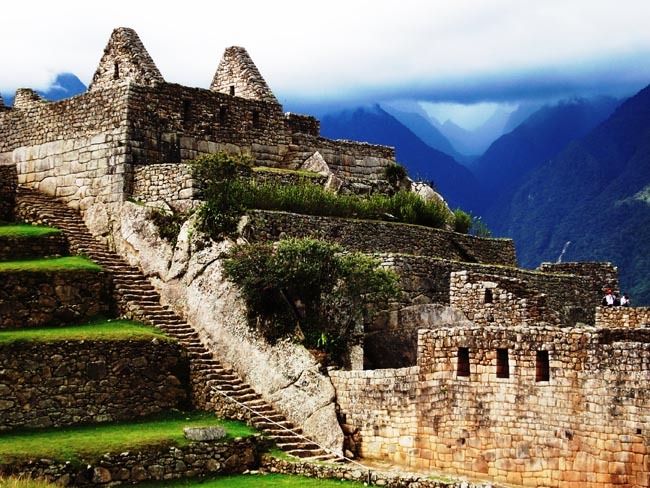 Most of the Peru portion occurs at high altitude, which is an important consideration as our program is active and we tour some sites which are hilly and large. Because of this element, all passengers must have a simple questionnaire form signed by a doctor indicating their suitability for travel at high altitude. As always, we encourage you to consult with your doctor before undertaking such an ambitious trip, especially should you have any pre-existing medical conditions. Overall our tour is an ambitious one, with plenty of moving around, some long days of travel and some early starts, full days of sightseeing, short walks to dinner, easy "hikes" to viewpoints and on archeological sites, possible extremes in weather and temperature, and travel to remote locations with limited services and access to medical care. 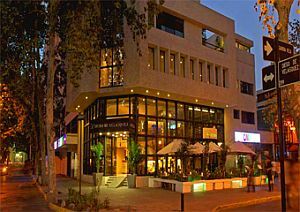 Well-located, heated/air-conditioned, mid-range (3 & 4-star) hotels with en suite toilet and bath throughout. Single rooms are limited in number and likely smaller than doubles in some locations. Porter service is usually available though you need to be independent with your luggage, especially at airports and train stations. Click on the "Map & Hotels" tab on this page for more information on accommodation for this tour.